As a longtime iPhone user, I have gotten used to typing long emails and texts on that teeny tiny keyboard, but that still doesn’t stop me from cursing said keyboard with each and every mistake (damn you, autocorrect). Thanks to the new Logitech K480 Bluetooth Keyboard, not only can I type error-free–or truthfully, more error free–but I can also use it with multiple devices at once. We have covered a variety of keyboards in the past, even this neat wooden Bluetooth keyboard (whaaat? ), but the Logitech K480 is way more practical and affordable than one beautifully handcarved from timber. The keyboard works with any Bluetooth-enabled device, whether it’s a mobile phone, tablet or computer. 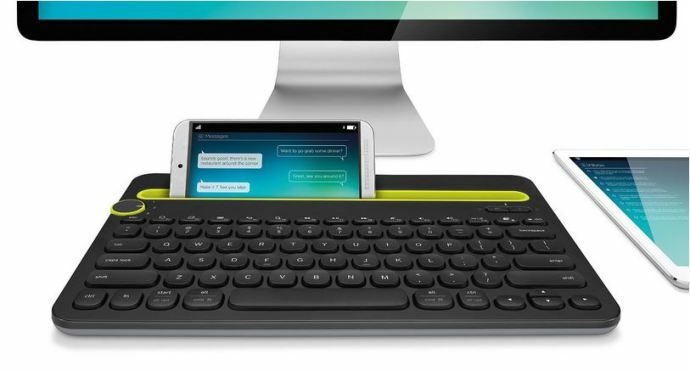 Obviously, all computers come with their own keyboards, but if you’re on a multitasking streak and want to get things done on devices simultaneously, this keyboard lets you connect three devices. Set-up is seamless., with a simple dial to indicate which device you are setting up, and then a simple button to indicate whether it’s a mobile device or a PC. After turning the keyboard on and then making sure your Bluetooth is on, the Logitech keyboard will show up in the list, sync, and boom. That’s the whole set-up process. Do that for any three devices and then you basically just turn the dial to switch among them. I also love the groove that’s built into the top of the keyboard to houses your tablet or device and makes it easy to see exactly what you’re typing as you’re typing it. You can fit a tablet and mobile phone in the groove and switch back and forth between the two with ease. 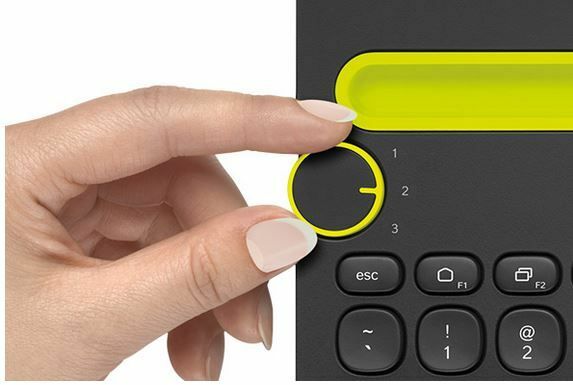 Now the keyboard is not quite full-size, but still solid and large enough that you can type as you normally would, even with the satisfying clicks that you give up on your mobile devices. Unless you want to annoy everyone in the vicinity with the typing on your iPhone; you did toggle off the keyboard clicks feature, right? The Logitech K480 Bluetooth Keyboard is available in black or white for $49.99. Check out the Logitech website for more information.